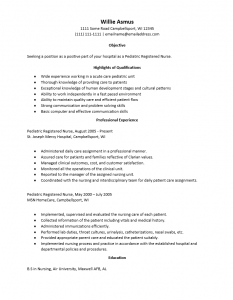 The Pediatric Nurse Resume Template provides a viable method of composing a high quality resume. This can done relatively quickly if the user has organized an outline of the content required for input. Resumes are a job seeker’s initial introduction to a potential employer when pursuing an opportunity. Its presentation and visual aesthetics will play an important role in enticing one to read it. The content of the resume will be the reason why one continues reading, will be a determining factor in a deciding whether a candidate should be called in for an interview, and is likely to contain topics of discussion during an interview. Step 2. The “Objective” section acts as an introduction of sorts. This is an area where you may boldly state your intention to get hired for the position being applied to. The example below is meant simply as that: an example. A true Objective section should be composed of two to three statements. It is helpful to point out how you would function or what attributes you would utilize once employed. Step 3. The “Highlights of Qualifications” heading is where you will directly relate your skill set to the requirements listed in the posting you are answering. This should really be as inclusive as possible when it comes to the job requirements. Step 4. “Professional Experience” is summary of one’s employment history. This is a serious section where you must report the specifics of where you have worked. 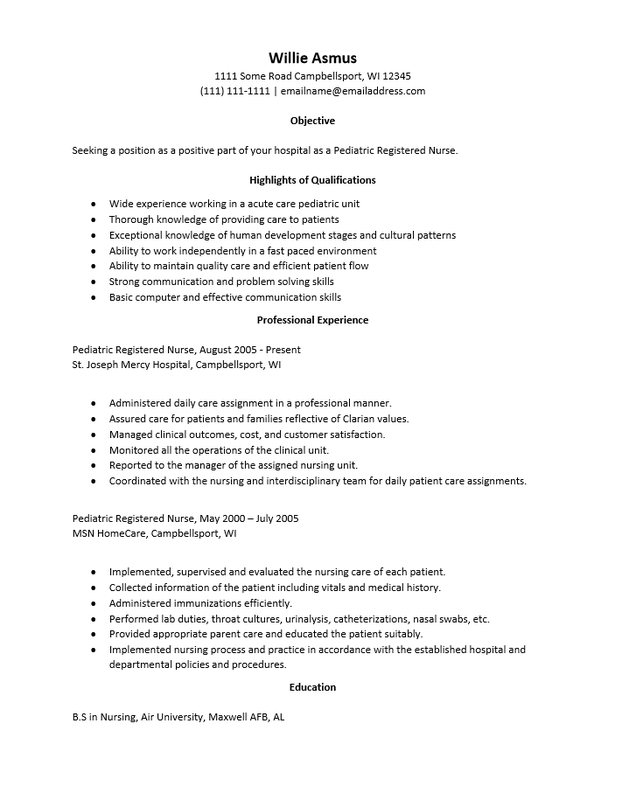 Each entry should have your official job title and the date range you held that position. This should be followed by the name of the employer and the location. Finally, a list of your duties/achievements there should be reported. Keep each entry short but be very thorough. Step 5. The final section of this resume template is the “Education” section. This is a section where you will input the type of degree you earned, the name of the institution where it was earned and any other relevant information. This section must be present on all pediatric nurse resumes.